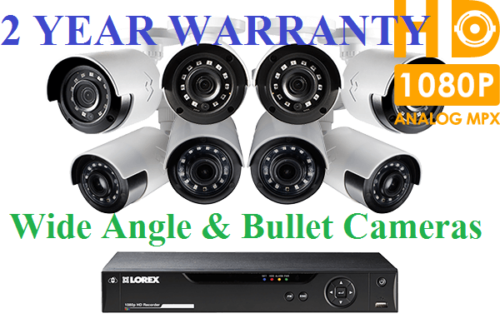 Protect your property with this robust and reliable security camera system from Lorex. 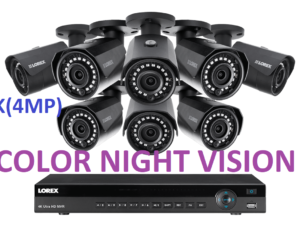 This powerful system features an 8-channel DVR, eight bullet security cameras with 1080p HD resolution and includes four wide angle cameras that are ideal for large area monitoring. Everything you need for setup is included, giving you professional-grade security without needing professional installation. 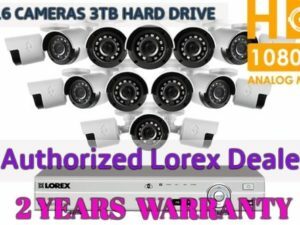 Protect your property with this robust and reliable security camera system from Lorex by FLIR. 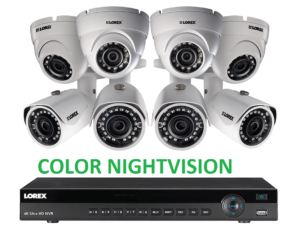 This powerful system features an 8-channel DVR, eight bullet security cameras with 1080p HD resolution and includes four wide angle cameras that are ideal for large area monitoring. 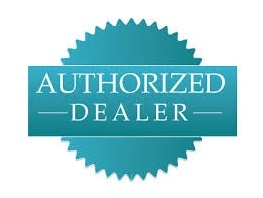 Everything you need for setup is included, giving you professional-grade security without needing professional installation. RapidRecap™ compiles hours’ worth of activity into a short video summary. It connects you to all the day’s events in a flash. See your kids coming home, your garbage being collected, your pets getting up to their usual mischief – all in an instant! Timestamping of moving objects tells you what happened and when. Experience the rapid way to stay connected and start to see more while watching less. View the entire scene with a single camera. This bundle comes with four advanced Ultra-Wide Viewing lens cameras that capture a large area. Whether you need to monitor a large room, the street in front of your house, or a large backyard, a single Ultra-Wide camera can often take the place of multiple standard viewing cameras. Boasting a massive 120° horizontal / 160° diagonal field of view, these sophisticated cameras are perfect for large area monitoring. 1080p HD footage can make all of the difference. All eight of your advanced security cameras are capable of recording high definition 1080p (1920×1080) video. This ensures crisp, detailed high definition live viewing and recording that will help you capture the details you need. All of your security cameras belong to our easy-to-install line of analog MPX cameras. These cameras use standard coaxial cabling to carry 1080p (1920×1080) video to your DVR. Each camera includes a 60ft UL rated cable that is in-wall certified and fire resistant. For larger properties, you can extend the video cable up to 800ft (244m) from the DVR using a single run of coaxial cable (refer to our Security Camera Extension Cables article for more details). Remain confident that your security cameras are on guard at all times of day with night vision that leaves nothing to the imagination. Our infrared (IR) LEDs provide unparalleled performance in the dark, allowing you to clearly see up to 130ft (40m) away in regular nighttime conditions, and up to 90ft (27m) away in total darkness. The integrated infrared cut filter switches on and off between day and night, ensuring accurate color reproduction during the day and crisp black and white infrared footage throughout the night. Don’t be afraid to install your cameras outdoors. They are IP66-rated to ensure protection against all types of bad weather. Be it heavy wind, rain, or snow, we’ve engineered our cameras to withstand the most unforgiving of North American climates. These all season security cameras feature a cable pass-through design that keeps power and video cabling concealed, which helps to prevent tampering. The durable yet lightweight Polycarbonate housing also makes this camera virtually immune to vandalism. Record crisp 1080p video to the pre-installed 1TB security grade hard drive. The 100% duty-cycle hard drive is designed for surveillance, providing reliable storage for weeks (or even months) of security footage. You can customize the recording settings to fit your needs. Record at 1080p HD (1920×1080) for the highest video quality, or set to a lower resolution for improved recording efficiency. Motion and scheduled recording option are also available to extend your recording time. 3. Requires a high speed internet connection and a router (not included). A minimum upload speed of 1Mbps is required for the best video performance. Up to 3 devices may connect to the system at the same time. 1. 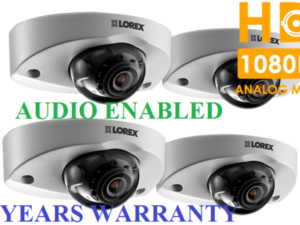 1080p HD cameras are compatible with Lorex 1080p HD DVRs only. For a list of compatible recorders please visit /support. *A Multi-Camera Power Adapter that provides power to multiple cameras or individual power adapters may be provided, depending on product configuration.